We were praying to Swami and I requested Bharathi Sir. He said, “Prakash, you don't worry. When it has to happen, it will happen.” He is so clear! 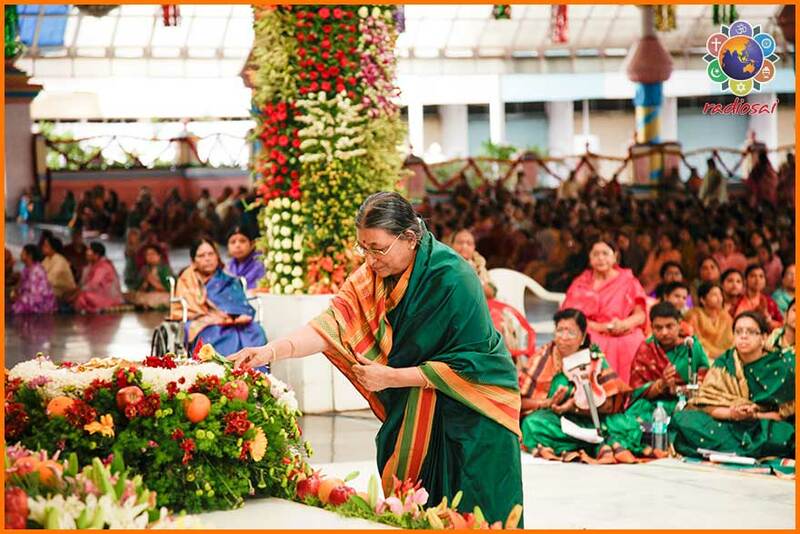 We initially thought of presenting all the five kritis for Swami's birthday in 2014 but that did not happen. Today if we listen to the kritis, we go “Wow!” but then we went through a lot before they were composed! It's not been a jolly, straight road or national highway ride. BP: Well, it is never like that with Bhagawan! CG: At every bump your ego is knocked down and, in every jump, your pre-conceived notions are broken! Every time you think someone is wronging you, at the end you realise it is only Bhagawan's will. He leads you to that level of surrender - “Swami, please! Now You do it!” Then things work like magic! He said, “Yes, I am working on them. Whatever Swami inspires I will do.” Months were going by and I was under tremendous pressure. But I decided not to call him for weeks, even though I knew he would not mind if I did. I was relieved that there was some progress. Sir had requested her to learn the three kritis and sing the rough tracks. He had taught her for about two weeks. She then took one week each to learn and rehearse the three kritis. She then came back to Sir and showed him what she had picked up. Sir said, “Yes, now you have reached a level where we can record the tracks. Let me call Sai Prakash and fix a date for recording.” And Sai Prakash calls up! Can it get more dramatic than this? I'm not exaggerating. I am not telling a nice story! This is exactly how it happened. Sir told me, “Let us fix a date for the recording.” So, we fixed March 12, 2015. We had no idea then that Poornahuthi of the Ati Rudram in Brindavan was on that date. However, since we'd already fixed the date we thought we should not delay further. The kritis had to be sung on April 24, 2015 - three songs which are in no way easier than the first two! Sai Shravanam was abroad and so we could not record the tracks in his studio in Chennai. We thought we will just take a microphone, laptop and a pre-amp, go to Sir's house in Chennai, record the three tracks and send them out as soon as possible. So, we went to Brindavan and on the morning of March 12, 2015, we discussed whether we were dishonouring Ati Rudram by cutting halfway through and leaving for Chennai because the Poornahuthi was to go on till 12:30 or 1:00 pm. If we stayed till the end, we would not reach Chennai on time for the recording. We had fixed it at 5 pm. We said, “This is Swami's work. That is also Swami's work” and decided to go. Something incredible happened that day. We planned to start around 9:30 am from Brindavan. The Ati Rudram was going on but we silently slipped out. Our car had come. There is an opening under the bridge right opposite the Brindavan ashram gate. I had suggested to the car driver, “Don't park right on the road because there's quite a bit of traffic. Turn under the opening under the bridge and park there comfortably, so that Vasanthalakshmi Madam can cross the road and get into the car.” Given that she is 67, we had to do things slowly. Our colleague Sai Prasad also was with us. He's the one who really worked very hard on the notations. We had to bring out a notation script for each kriti. Then it could be read like how Western musicians read music. He worked behind the scenes to make this happen. So, I was in the front of the car and he sat behind. Madam put her bag in the car and the driver thought she was already seated and started the car. In the process, her saree got stuck in the door and then the disaster happened! She slipped and fell! CG: There was pandemonium all around. People were shouting and scolding the driver. He was so nervous that he just stopped the car. In that split second a person standing in the corner came rushing and held Madam's head and didn't allow her head to hit the ground. I was in front and was wondering why people were shouting. As I looked back, I could see her just falling down. By the time I could open the door and come, she was already down on the road. In all this confusion, the driver stopped the car. And where? Right on Madam's leg! The back tyre was on top of her leg! Even now it just sends shivers when I think of this! I just shouted, “Sairam! Sairam!” when I saw this. Half the people said, “Take the car forward.” The others said, “No, take it backward.” Some sense prevailed, and the driver took the car back slowly and that was the right thing to do! She said, “If it's not paining, why should I say it's paining?” It was totally astounding! Her leg was under the tyre for at least 10-15 seconds and she was saying she was not hurt at all. We went to the X-ray department but that day the technician was on leave and was happily enjoying Ati Rudram. You won't believe it, but for the next 6-7 hours we travelled from Bangalore to Chennai with just some ice on her leg. We went to Sir's house, did the track recording and Madam immediately left for Tirupathi that night. She reached late around 1 or 2 am. Next morning promptly she went to the hospital to get an X-ray done and found out that her leg was perfectly fine. What more can we say? 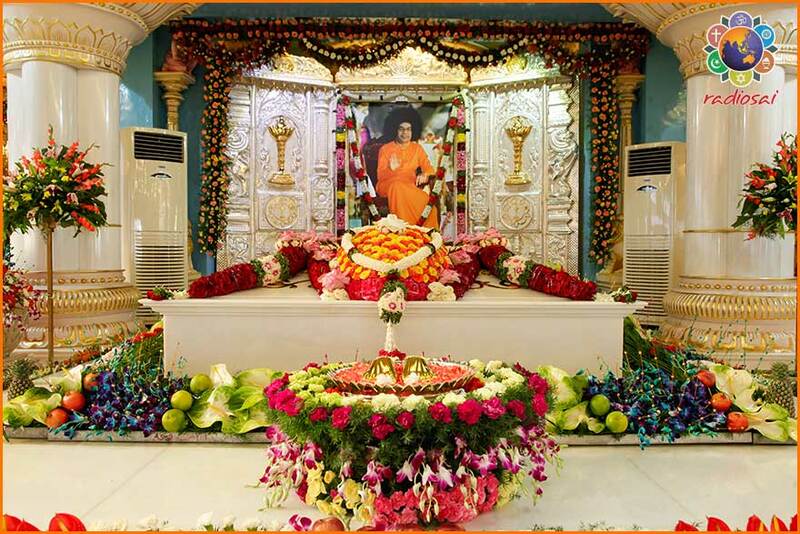 When Swami says, “I am there and looking after you.” He really shows it! BP: Well, you asked Lord Shiva, the One who is beyond time, space, birth and death to take care! And He did it! CG: Yes! That's how we recorded the three tracks and sent them to all the musicians. SVV: But only after the notations were written! On March 25, 2015, there was some clarity on the tracks and the notations because even to notate these songs is so difficult. It's as if these ragas are some living entities who said, “Ok let me choose this song.” You just cannot have a substitute raga for these songs! The ragas have gelled in so well that anybody listening to the songs will think they have been composed by one person. Nobody will know that there are two people who have composed - the lyricist in Puttaparthi and the music composer in Chennai! Only Swami can do this! 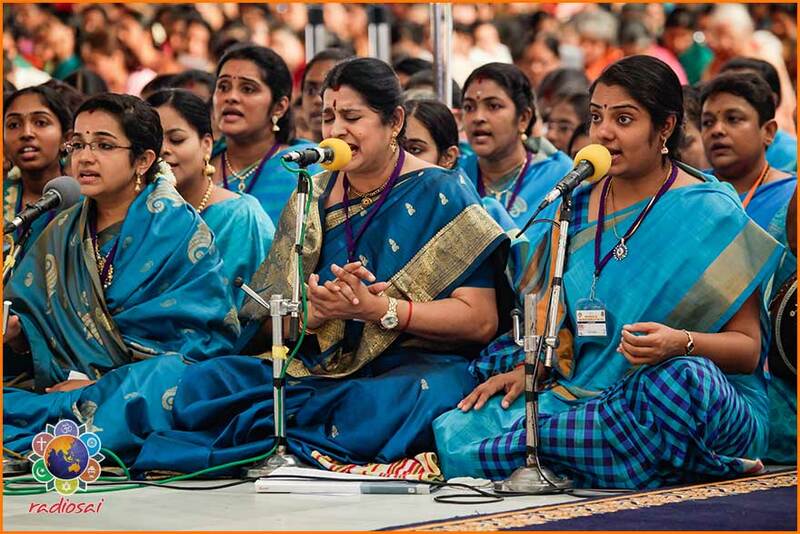 BP: Amazing confluence of raga, bhava and tala! And Divine grace working through so many people! CG: That's the point. In perfect synchronicity! The more you know about the background story, the more you will appreciate each kriti when you listen to it. 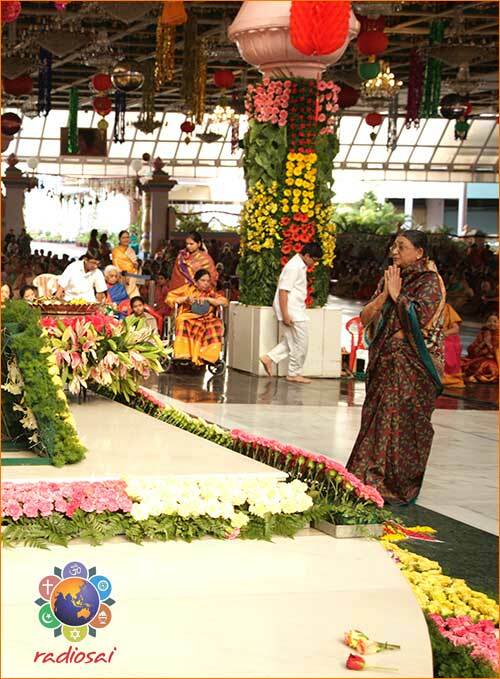 That is because these were composed with so much of love for Bhagawan and with total surrender to His will. Virtually, He did it! BP: If you read Tyagaraja's life and then sing any of his kritis, it will be a completely different experience. Similarly, when you know how Sai made the Sai Pancharatnas happen, you'll know how you should put your heart and soul into every kriti because Sai has put all His heart and soul into it! CG: So true. Maybe we should discuss each kriti, one by one, in detail.